Mad Science Invitations: A four-color invitation with cartoon children enjoying a science birthday party; includes envelopes. Mad Science Goodie Bags: You won’t find a better or more affordable selection of quality science novelty items anywhere else. Includes a Mad Science Wrist Wrap, Temporary Tattoos, Polymer Putty, Flip Top, Spin Disk, Soak N’ Grow, and a Helix Flyer. All inside a cool Mad Science Bag! Mad Science Lab Coats: Have the children at your birthday party feel like they are in the Mad Science Lab with these child-sized “carbon” copies of the Mad Scientist Lab Coat! Super Party Pack: 10 Goodie Bags, 20 Mad Science Invitations, and ONE Interactive Activity (excluding the Mad Science Hovercraft). Best Value! A savings of $7.50! Mad Scientist Party Pack: 20 Mad Science Invitations, 10 child-sized Mad Scientist Lab Coats, and ONE Interactive Activity (excluding the Mad Science Hovercraft). MASS-ive Party Pack: 20 Mad Science Invitations, 10 Goodie Bags, 10 child-sized Mad Scientist Lab Coats, and ONE Interactive Activity (excluding the Mad Science Hovercraft). Dry Ice: WOW, THAT’S COOL!!! We use dry ice to demonstrate the three states of matter. Children get to taste a burp, take a Mad Science dry ice shower, and enjoy a fog effect finale! Rocket Launch: 5…4…3…2..1…BLASTOFF! Includes a Mad Science rocket kit for the birthday child. Cotton Candy Making: We’ll bring a full size cotton candy machine and show the children the mouth-watering science behind this favorite confection. Mad Science Hovercraft: Take a ride on our disc and feel like you’re riding an air hockey puck! 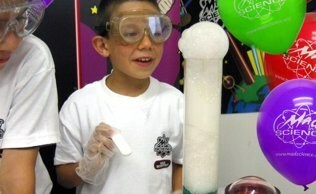 Call (801) 292-8646, email info@madsciencegslc.com, or fill out this form today to book your child's birthday party!